Here are some crowd funding projects of interest. We are strong believers in the crowd funding process and encourage readers to participate either by entering a project for funding or supporting others in their endeavors. Here are a few that we found to be of interest. Biomechanical Robotics Group was founded with the vision of creating lower cost and highly functional prosthetic solutions for a large community of users. We have developed the Nu Hand3D printed hand prototype as a first step in fulfilling our vision. The Nu Hand is designed to address key needs and concerns in the amputee community and beyond with regard to practical, functional, affordable, and aesthetically pleasing prosthetic solutions. What is the Nu Hand? The Nu Hand is an advanced 3D printed prosthetic hand prototype that we are working on and would like Kickstarter backing to develop further. The Nu Hand design more closely mimics natural movement, has replaceable components, will have rigorous engineering tests performed on it (durability and failure tests) and can be size matched to anyone. A reality shared by all prosthetic devices is that with the wear and tear of normal use, they will eventually fail. With that in mind, a key feature of the Nu Hand solution is a completely modular chassis. The modular chassis design means that users with access to a basic set of tools will be able to easily replace components as needed without the wait times often faced with traditional prosthetic repairs. The Nu Hand is designed to mimic the complex mechanisms found in human hands with simple solutions to deliver practical mobility and functionality. Muscles that pull (never push) drive human hand motion naturally. We demonstrated the Nu Hand solution in the introduction video (see above); creating a closed fist by pulling the clear 'tendons'. The Nu Hand will have elastic bands on the backs of the fingers allowing them to return to their original relaxed position after the 'tendons' release. This provides stability to the joint while closing (in real life, there are many bundles of muscles and tissue supporting each finger and joints). We have allowed the fingers to have side-to-side (lateral) movement. This provides a means for a user to splay their fingers naturally for additional support or personal expression the way a human hand can naturally. A servo motor will be used to move each individual finger laterally (we hope to demonstrate this feature in an update to backers soon after project funding is complete). Concurrently, we are in the process of developing a drive system with the goal of closing individual fingers with one motor. This is a unique approach as it would be much easier to drive the hand with five motors (something we plan to do during the next stage development). However, we feel that the benefit of using fewer motors will allow the Nu Hand to have longer battery life and be lighter weight. The Nu Hand will be using muscle sensors that are available on the market to drive motion. Muscle sensors are well established and are able to provide signals to a micro-controller to tell a finger to move. However, we understand that some individuals may not have a strong enough muscle signal to initiate finger movement. Taking that into consideration we have plans to explore and develop alternative ways to control the Nu Hand that are not limited to muscle sensors. 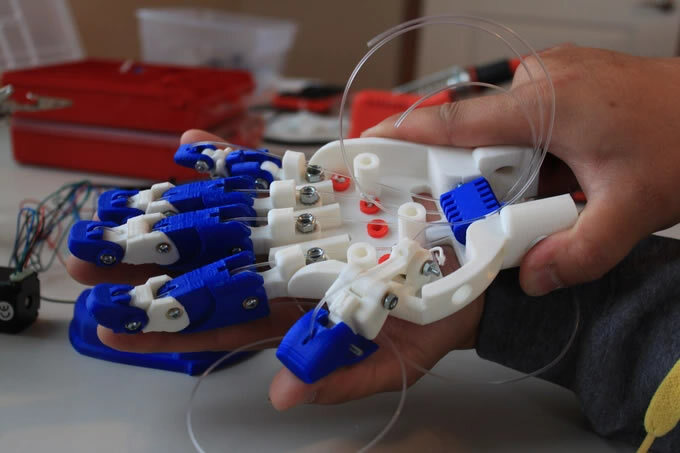 The goal of this Kickstarter project is to finish the Nu Hand prototype that will open the door to new possibilities in the market. With your help, we hope to be able to achieve our goal on this project. Thank you for your time and attention! We will continue to update you on our research and development progress. 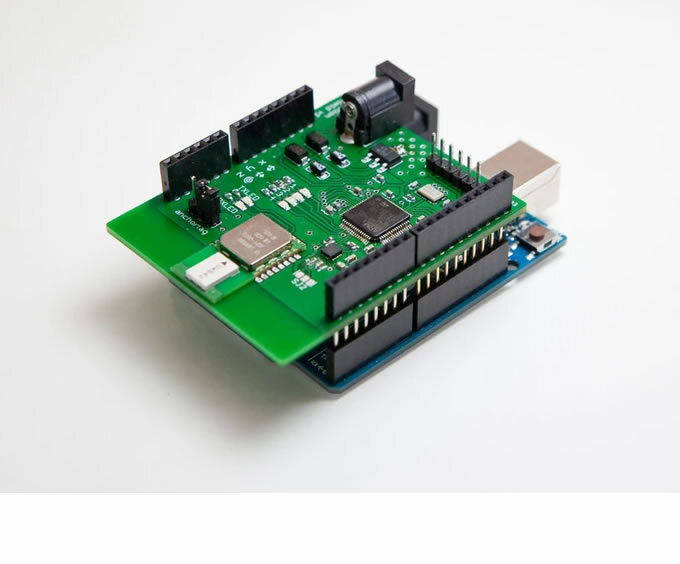 Pozyx is the first affordable and easy-to-use hardware solution that provides accurate indoor (and outdoor) positioning and motion information for Arduino. In order to achieve a positioning accuracy of a few centimeters, the pozyx system relies on a novel wireless radio technology called ultra-wideband (UWB). The accuracy achieved with this ultra-wideband technology is several times better than traditional positioning systems based on WiFi, bluetooth, RFID or GPS signals. Furthermore, the signals can penetrate walls and make it suitable for indoor environments. Our system is very similar to the GPS you have in your car. Like the GPS satellites in the sky, Pozyx requires 4 little anchors to be placed on the walls. The Pozyx board is what you will put on an Arduino to track it. Positioning is achieved by making range measurements (by means of two-way ranging) with the anchors. The Pozyx tags processes all measurements to compute the position and orientation of the board, at a high update rate. Indoor ranging and 3D positioning: Ultra-wideband (UWB) technology is the key to accurate ranging and positioning. However, the UWB-module itself only provides accurate timestamps. We have implemented state-of-the art algorithms to obtain the most accurate ranging and positioning information. Automatic anchor calibration: 3D positioning requires at least 4 anchors to be within range (3 for 2D positioning). In general the position of these anchors must be known in advance. Pozyx provides the feature to obtain the anchor positions with a single line of code. No manual measuring required! Remote control: With the use of ultra-wideband wireless technology, messages can be transmitted over the air. These messages can be text or user data, but also commands to control remote pozyx modules. We made it possible to remotely turn on LEDs, toggle pins, read out sensor data, and much more. Perfect for your home automation project! 9-axis sensor fusion: Pozyx is equipped with an accelerometer, gyroscope and magnetometer. With these sensors it is possible to obtain the orientation of the device. However, separately these sensors all have their flaws. For example, the accelerometer is noisy and the gyroscope is biased. Together these flaws can be mitigated. Pozyx offers 9-axis sensor fusion (3 axes for every sensor) to get the best possible measurements. Reprogrammable: By default, we program the board with our firmware for localization and tracking. However, it is possible to reprogram the microcontroller to suit your own needs. Using the debug pins (SWD), you can load your custom code on the microcontroller of the board. We provide you with detailed tutorials and example files that take care of all the configuration: gpio pins, leds, clocks, and all the sensors (through SPI or I2C). Seek N' Sneak - Your robust robotic pet. Seek N’ Sneak is an Arduino powered self-controlled robot which is able to run around, find objects, grab them, relocate them and do many other useful and funny things. Seek N’ Sneak robot at a glance. The two driving wheels of this robot are powered by independently controlled motors and equipped with 128-steps-per-revolution encoders allowing for precise control of the angular position of the wheel, as well as its velocity and acceleration. An independent 2D orientation of the rover is provided by two side mounted IR proximity meters. Objects are detected by the third centered IR proximity meter. The three IR sensors can be replaced by one PING)))™ Ultrasonic Distance Sensor. The arm is run by 3 super-strong servo-motors, so it is fast and powerful enough to push up about 3 pounds, or even lift the robot itself, or throw objects. Seek N’ Sneak is an Arduino Mega 2560 powered robot. The robot software is completely open sourced, so you can either use the original software which has already been developed for you, or you can modify it as you please to meet your demands. You can then use commands like LOOK FOR AN OBJECT, GRAB or THROW instead of writing low-level code to control the sensors, motors and servos directly or develop your own way of thinking for the robot from scratch using the Arduino integrated development environment. Though Seek N’ Sneak was designed as a fully autonomous, upgradable robot. There is plenty of space inside the body of the robot to extend Arduino board with extra sensors or with Wi-Fi or Bluetooth shields to establish communication with a computer or remote control. What can Seek N’ Sneak robot do? - you can make it organize your living space, placing things back in place whenever they are found where they should not be.